We’ve had thousands of entries to our ‘Great Name Game’ competition, we thought Simon’s contribution invited a response and might get some new rhetoric started. .
That suggests that bonefide companies need to use ‘straight-laced names’ and only ‘dodgy traders’ choose memorable, imaginative, tongue-in-cheek brand names – presumably so you know NOT to trust them? I’m not sure what that statement says about Google, Moon Pig, Virgin or even Boots and what message is the book seller Amazon sending, given that paper production is the biggest single reason for shrinking forests. 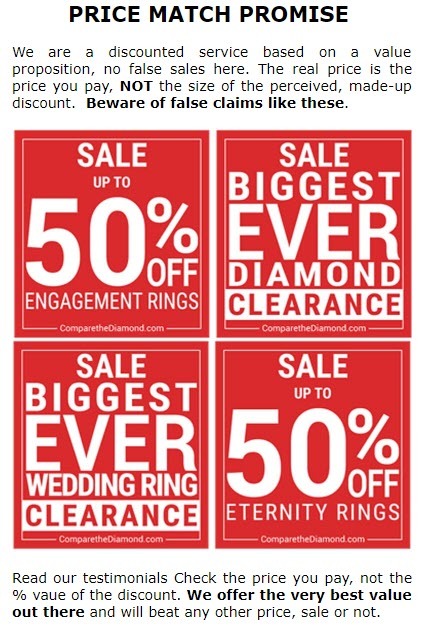 Our registered brand name is the very popular catch phrase ComparetheDiamond.com (formerly diamondgeezer.com) not psst-wanna-buy-an-iffy-diamond.com and what are the chances of you remembering anotherjewellers.com. Surely the con man is going to get as close to a strong brand like Tiffany, Cartier as possible? Maybe Tiffony or Cartiar - actually I have no idea how the con man’s mind works and presumably they wouldn’t be very good con men if we did know their mind-set. That assumes that you know about diamonds, surely with an untrained eye and far from perfect lighting conditions it is unlikely that you would be able to discern diamond qualities or values looking at a 1 carat diamond which is just 6. 5mm across.